Dominance is defined as “the condition of being dominant,” and to be dominant is to “occupy or be in a commanding or elevated position.” For a team to be dominant in college football is now somewhat rare, and apparently becoming more so. Regardless of how you define dominance – including which era (No. 1 ranking in a poll or polls, BCS champion, playoff champion) you are considering — few are the teams that can lay claim to the title of “dominant,” few are the teams that can say with assuredness that they were dominant for more than a year, and few have little hope of becoming so. We may never hear the word “dynasty” associated with a college football team again. 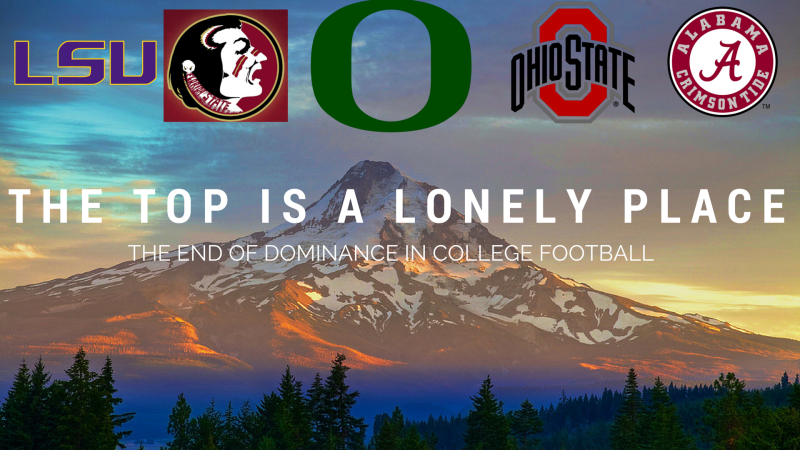 It’s hard to argue with Oregon’s claim of dominance, at least until this season. Between the 2008 and 2014 seasons, Oregon was 80-14 with three Rose Bowl appearances (2-1 record), a Fiesta Bowl win (beat Kansas State), an Alamo Bowl win (beat Texas), and two National Championship appearances (lost both, to Auburn and Ohio State). Oregon is one of only two teams to post consecutive 10-win seasons over that time (seven straight seasons! ), the other – Alabama. In other words, during that stretch Oregon was at the top, in rare company, and was dominant in pretty much any way you can define it. The Ducks were in a top bowl every season and won four out of seven of them against the best competition in the country (excluding Texas, of course). They didn’t win any national titles during that run — a weak spot in any Oregon argument – but they didn’t get blown out in those games either. They lost to Auburn on a field goal with zeroes on the clock in 2012. They lost to Ohio State 42-20 last year, but remember it was 21-20 with one second left in the third quarter, and Ohio State put up 42 on Alabama in the playoff game before. The two QB’s who beat Oregon in title games. Before we can look forward and consider the potential for teams to dominate and develop a dynasty, we have to look back. Oregon’s first 10-win season in this streak was 2008 and for many teams that was the end of an era of dominance, or nearly so. That year Florida ended 13-1, USC 12-1, Texas 12-1, and Utah 13-0 (but not from a Power 5 conference). Oklahoma was 12-2, Alabama 12-2, TCU 11-2, Penn State 11-2, Boise State 12-1, and Ohio State 10-3. Those names are familiar for two reasons: they’ve either continued to be perennial winners or they’ve fallen into mediocrity (by their standards at least). Alabama, TCU (non-Power 5 at the time), Oregon, and Ohio State all maintained their high level of play over several years. Florida, USC, Texas, Utah, Oklahoma, and Penn State have all struggled, some much more than others. By the end of 2010, Florida, Texas, and Penn State were nowhere to be found at the top of rankings. As the Big-12 matured, Oklahoma began slipping in 2011. Other teams rose to the top for stretches, such as South Carolina, Stanford and Florida State. Michigan State and Wisconsin have been strong during this period as well. There have been a few one-season wonders, such as Missouri in 2013 (12-2). For nearly every one of these teams, its success can be traced to three variables: recruiting, coaching and a great quarterback. This is college football’s “threefold cord.” The quarterback doesn’t even have to be elite, not even NFL third-string caliber, but he has to be great for that team at that time. 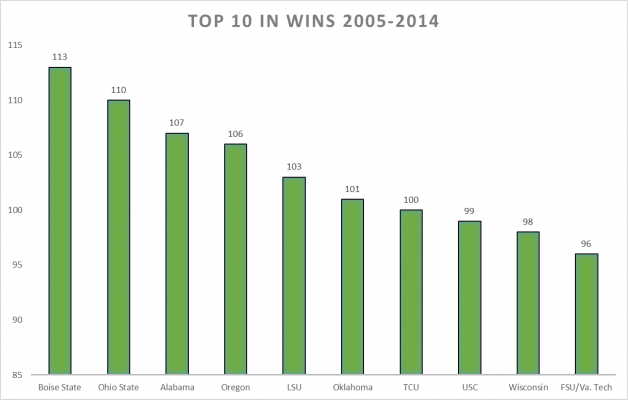 First, let’s look at the teams with the most wins over the past 10-years, current season excluded. Of these 10 teams, the following did not win a national title during that period: Boise State, Oregon, Oklahoma, TCU, USC, Wisconsin, and Virginia Tech. Let’s take a closer look at just the ones who have played for a national title in the past five years. *Auburn played for the title twice during this time period, so even though they don’t make the Top 10 in wins over the last 10 years, they make the list. All of these coaches are considered good, some great. Most of these quarterbacks made it to the NFL and most of them are still there — a few are even starting for their teams. All of these teams had the same characteristics: great coach(es), recruiting and a QB that was great for that team at that time. Two of these teams had a decade between titles (FSU and OSU), two teams had two wins in a relatively short window (Florida and LSU), and only Alabama had three wins, with a 10-3 season in 2010 between them. Saban is the only coach in recent history to win three national titles. Looking across all of these teams and all of these different time periods, one can see it’s clear that developing a dynasty is nigh impossible, and even just being dominant is very difficult. Just a handful of teams have put together runs of dominance in recent history, and many more have had stellar years only to fall quickly into mediocrity or worse. Now let’s take a closer look at the PAC-12 because by now you’re tired of hearing about teams from the South, and it’s where one of the elite teams over the past seven years, the Oregon Ducks, reside. So in the PAC-12 we have four teams in the Top 20 in recruiting: Oregon, USC, Stanford, and UCLA; no surprises there. We have only two teams with quarterbacks in the Top 20, USC and Stanford (but CAL is close at 21). The Athlon coaching ranking is what it is, but something does stand out here. Stanford has the No. 3 coach in the PAC-12, the No. 3 QB in the country, according to QBR, and the No. 11-ranked recruiting class. USC has the No. 12 quarterback and the No. 17-ranked recruiting class, and … a head coach in rehab. 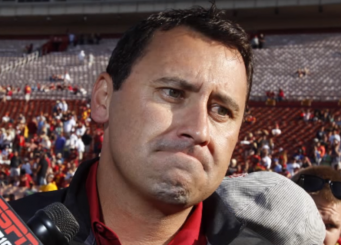 Questionable coaching hires at USC have resulted in the absence of dominance. So — let’s talk about the future now that we’ve looked at the past and the present. I think we can assume that the four teams in the Top 20 of recruiting will continue that trend. Assuming without coaching changes at Oregon, Stanford, and UCLA, I think we can assume they will continue to experience success. USC is a bit of an outlier with the constant coaching changes. The Trojans always recruit well and as a result have a ton of athletes, but haven’t been able to put it all together. It’s easy to point to coaching as the reason, because, well, that’s the reason. I think it’s safe to say that Oregon’s chance to be dominant this season evaporated with the Utah loss. The question is, can they return to dominance, and if so, when? They have the recruiting, they’re pretty sure Mark Helfrich is a good or great coach, but what about the third factor? The quarterback? Vernon Adams is gone after this season, Jeff Lockie has been somewhere south of impressive, and Tyler Alie appears to be an excellent runner. Behind them they have some complete unknowns – so the outlook is cloudy with a chance of rain. Without a quarterback that can efficiently run the Oregon offensive system — and let’s be honest — at this current time they don’t have one, and they can expect to continue to struggle on offense. The Duck secondary, linebackers and offensive line, other areas of concern this season, will be better. Receivers and running backs will continue to excel. But without that third piece, that third cord, we cannot expect to return to dominance. Hopefully, it’s just a season or two away from the top, away from dominance. But only time, and Oregon’s quarterback play, will tell. The top is a lonely place indeed.